I’d like to send congratulations to two Bay Area players who scored impressive recent accomplishments. First, Daniel Naroditsky was recently named the winner of the 2014 Samford Fellowship, which is more than just a scholarship — it’s a living wage that lets talented young players focus on nothing but chess (if they want) for a full year. Here is the story on the USCF website announcing him as the winner. Daniel is the current U.S. 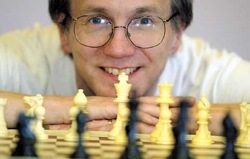 Junior champion and the author of two chess books, Mastering Positional Chess and Mastering Complex Endgames. The USCF calls him the “youngest published chess author in history,” which is something not even people like Bobby Fischer or Sergey Karjakin can claim. I think that the books show to an unusual degree the secret to his success, which is just a prodigious amount of work and a total commitment to getting to the bottom of complex positions. I helped with the editing of both books, and my “contribution” (if it was one) was to remind him was that not everybody has his level of dedication. Occasionally a two-page-long analysis needs to be abridged a little bit because readers just won’t be able to grasp all of it. But there’s no arguing with Daniel’s results! The second milestone is one that I haven’t seen any press releases about, but I thought it was pretty cool: Samuel Sevian made the FIDE top 100 junior list. Not only is he the #5 American junior (after Ray Robson, Daniel Naroditsky, Darwin Yang, and Kayden Troff), he is also the FIRST PLAYER IN THE MILLENNIAL GENERATION to make it on to a FIDE top-100 list! That’s right, Sevian was born in 2000, and he is the only player on the list that has a birth year beginning with a “2”. Only one person can be the first, no matter how many others come after him. I’m sure that Sevian, too, will be a Samford Fellowship winner someday. By the way, for what it’s worth, I have a 50 percent lifetime record against both of these prodigies: one draw against Daniel Naroditsky and two draws against Sevian. That’s one of the great things about living in the Bay Area — you get to play all of these incredible players before they become grandmasters! It’s nice that Samuel has made the top-100 junior list…but it would be much better if he was the first post 2000 jnr to crack the top-100 overall rating list!